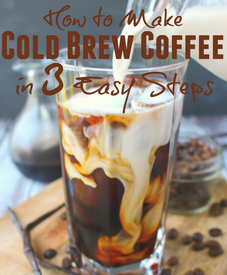 Cold brew coffee in 3 steps! Ever wondered how to make cold brew coffee? It’s much easier than you think! Cold Brew Coffee is a fantastic base for frappuccinos, iced coffee recipes, or great to heat up as a traditional brew. Smooth, not bitter, and a must-know for every coffee lover! Another advantage to making your own Cold Brew is that it’s gonna save you big bucks versus buying it at the coffee shop. I’ve noticed that grocery stores are now carrying bottled cold-brew, but even this gets to be a bit pricey. With this super-simple 3-step cold brew method from Delightful E Made, you’ll have an amazing coffee concentrate right at home in your fridge, and it will be pennies on the dollar what you would normally spend buying it already prepared.